While browsing the book Who’s Who of the Colored Race published in 1915 I came across an entry mentioning Ripley, TN. The entry belongs to Edward Bailey, son of Edward and Peggy Bailey of Brownsville, TN. Edward left Brownsville, attended Fisk University and became very successful in the field of education. He married Fannie Virginia Perdue of Ripley, TN in 1894. Together they had 4 children. 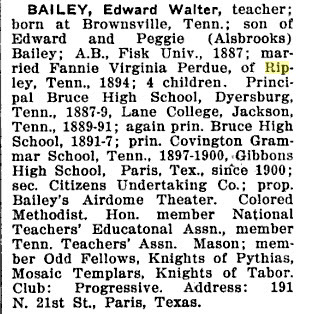 Edward Bailey went on to become the principal of Bruce High School in Dyersburg, TN. He also worked at Lane College, was principal of Covington Grammar School in Covington, TN, and also worked as principal of Gibbons High School in Paris, TX. He was a member of the National Teachers Education Association and the Tennessee Teachers Association. Who’s Who of the Colored Race Volume One 1915. Ed. Frank L. Mather. University of Michigan, 1915. 15. Google Books. Web. 23 Aug. 2011. <http://books.google.com/books/about/Who_s_who_of_the_colored_race.html?id=RFZ2AAAAMAAJ&gt;.